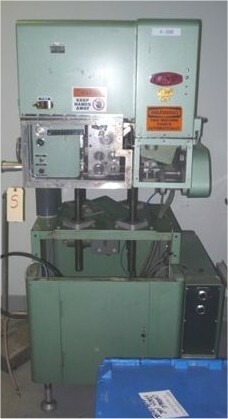 Used King Model CF100R Automatic Cottoner. Serial #12799011. Machine is capable of inserting cotton into bottles at a rate of up to 100 per minute. Containers Dimensions: 25mm to 75 mm diameter, 18mm to 200mm height, 10mm to 50mm neck size. Length of cotton is adjustable for different size bottles. Electrics: 3/60/220 volts. Was last used in a pharmaceutical facility and is available for immediate delivery.